Retro Sweets - Why Do We Love Them So Much? What is it about retro sweets that make us all love them so much? Why do we go all misty eyed when we start listing the old-fashioned sweets from our childhood... and find that the list goes on and on as other favourites pop into our mind? Well here's why we think that retro sweets in the UK hold such a special place in our hearts. You Remember Lots Of Old-Fashioned Sweets From Your Childhood... but you thought they’d stopped making them. Here are our current 100 best-selling, mouthwatering sweets. How many of these vintage sweet classics do you remember chomping on? You Find Other Traditional Sweets That You'd Completely Forgotten About. These are the real retro sweets gems! There will be other sweets that you'll see as you browse around A Quarter Of... that you had forgotten all about. Whether it’s Gold Nuggets (the gold pieces of bubblegum in a little cloth bag), kali or Spanish Gold - the old-fashioned sweets that bring the most nostalgic memories are often the ones that had slipped your mind completely! The old-fashioned sweetshop where we used to buy our sweets. There seemed to be a little sweetshop on every street corner and in every parade of shops. Often they were very small and sold nothing apart from newspapers (and comics), cigarettes and tobacco, and lots and lots of sweets. Oh and they had one of those Walls (or Lions Made) ice lolly freezers for hot summer days too. Our local sweetshop had a stand in the corner with lots of jokes on... it was brilliant! Your first taste of spending money. You used to be spoiled for choice; it was so difficult to choose what to spend your pocket money on. 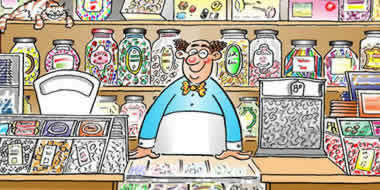 But the lovely lady behind the counter (did every sweetshop have a little old lady, with her hair in a bun, serving in it?) never rushed you; I think that she knew that the choosing process was one of the joys of buying traditional sweets. I used to stand there looking in wonder at all of the options – deciding what would go into my little white paper bag. And then, just as I was about to commit, a different old-fashioned sweet would catch my eye and I’d change my mind again. It’s great being a child in a retro sweetshop – but it makes deciding so very difficult! The memories they bring back. Just hearing the name of an old favourite like Anglo Bubbly Bubblegum brings memories flooding back... whether it was the long hot summer of 1976, playing football in the park with jumpers for goalposts, the Bay City Rollers on the radio and all the most fashionable kids copying their Shangalang wearing tartan to look really groovy! (I didn't say it was ALL good!). So if that's what just hearing the names of your favourite retro sweets does, just think what memories are brought back by seeing your favourite childhood sweets again. Or, best of all, actually tasting them! Prepare for a delicious trip down memory lane... and enjoy the best retro sweets ever!